The desks were manufactured using the CNC milling machine for cutting out a groove for cable management and the laser cutter to engrave the incubator’s logo into the wood. The main challenge was finding an efficient way to move the heavy sheets of wood from one machine to another.  The gcode was generated using Autodesk Inventor HSM platform. 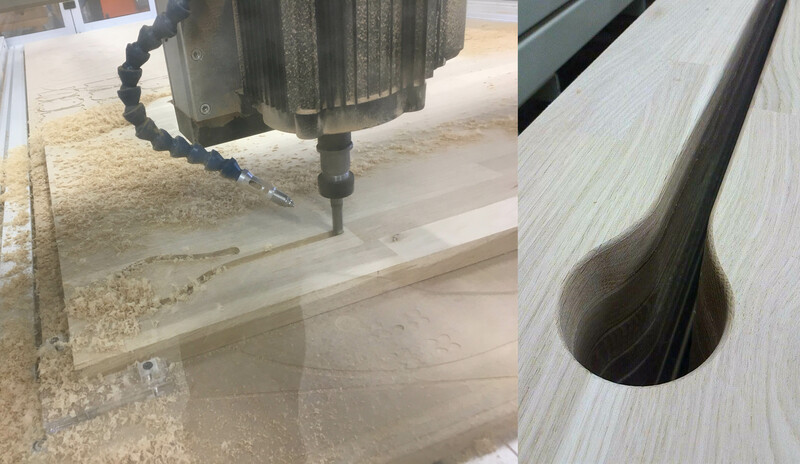 First the groove was cut using a 12 mm flat mill followed by a 3.5 mm radius mill, creating a small fillet. This final operation came with some challenges, mainly due to the a certain bending from some of the sheets of wood. Small mistakes weren’t too critical as they can be fixed with the good old sand paper. Slot for cable management being cut with CNC router. The cutting process for one desk took around 15 minutes. Because the CNC machine has an magazine of tools, it was possible to program a automatic tool change, drastically reducing the production time. The next process was engraving the incubator’s logo into the wood. This step could have been done in the CNC milling machine using a small size flat mill or a v-bit. The laser cutter was instead used because it gives the logo more of a branded look. A nice contract between the natural look of the wood and the dark burned look made by the laser, making the logo more visible. 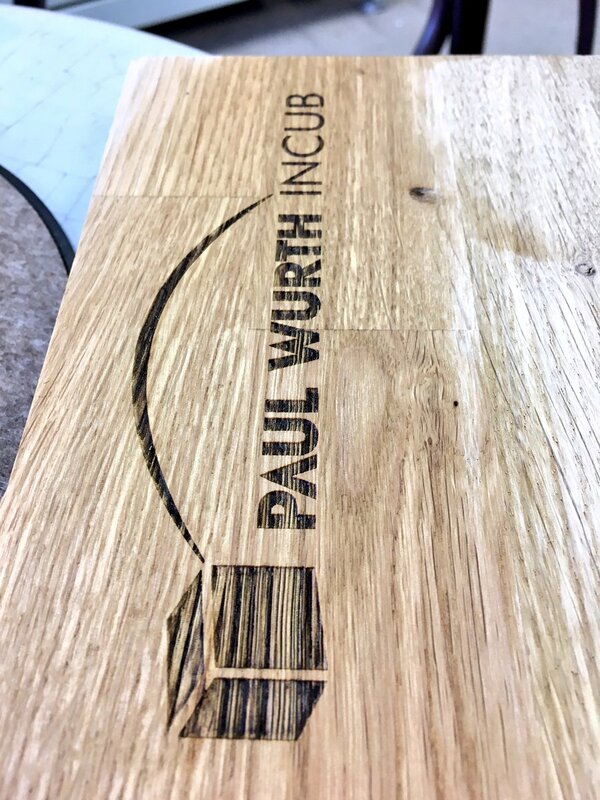 Laser engraved Paul Wurth Incub logo. 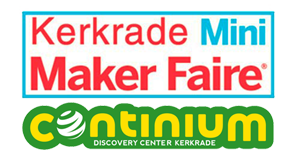 In total, 24 tables were made in the FabLab Luxembourg within more or less 2 working days. The picture below is the final look of the tables, treated with natural oil, enhancing the natural patterns of the wood. The tables were designed by Sébastien Wiertz, the Incubator’s manager. 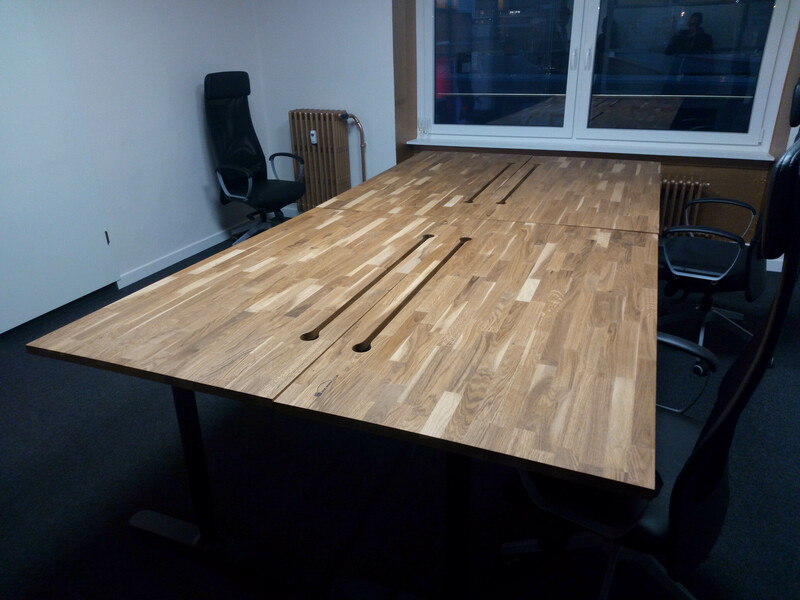 The tables were manufactures using the tools available at our FabLab located in Differdange, Luxembourg. Today, the desks are installed at Paul Wurth’s Incubator, located in the vile of Luxembourg.